2011-2011 Ford F-150 3.5 Turbo V6 Injen PowerFlow Intake5Ken P.August 18, 2011Every thing that came in the box was top quality stuff. The fit and finish was exceptional, the instructions were very detailed, and installation was a snap. The only issue I had was that the inside of the intake pipe was covered with aluminum shavings, I assume from the manufacturing process. I'm not sure if that is how they send them out or if someone at the factory just forgot to clean mine. Cleaning out the pipe was not a problem. When you take your intake out of the box just make sure to inspect it. I wouldn't want the amount, or any amount, of metal shavings that was present getting sucked into my engine. 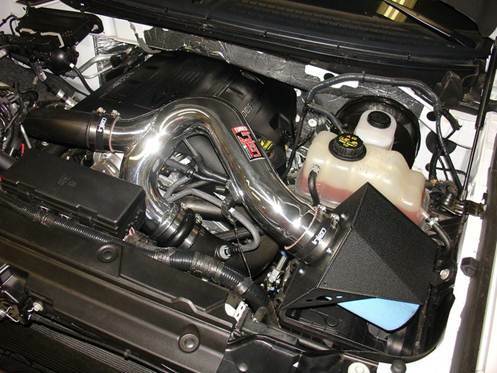 This particular Injen Intake uses a revolutionary design that splits on one end to accommodate the turbocharger setup. At the end other of the Injen Intake is the Injen High Flow Air Filter Element, protected by an Injen Heat Shield. The Injen air filter can be cleaned and reused for as long as you own the vehicle. An incorporated velocity stack smooths out airflow to help maximize power gains. Comprehensive installation instructions including photos make installation of your new Injen Intake easy enough to do yourself with basic hand tools in an hour or less. 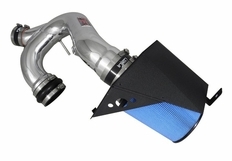 Everything you need to install this air intake is included and the intake comes with a lifetime warranty. The Part number for this item is: PF9013P or PF9013WB (depending on your color choice) and it fits 2011 Ford F150 3.5 V6 EcoBoost models.